Thanksgiving weekend features some of the biggest shopping days of the year, and seeing as Minneapolis and St. Paul are always popping up on lists of America’s most literate cities, you can be sure a lot of the purchases around these parts will be books. In addition to Black Friday, independent bookstores have been celebrating Small Business Saturday over the last few years as a shop-local alternative, with author Sherman Alexie’s Indies First campaign helping to bring authors into stores to volunteer as booksellers for the day. There’s also Plaid Friday, which is organized through the Twin Cities Metro Independent Business Alliance. As always, most of the many, many bookstores in the Twin Cities and around Minnesota are participating in some form with sales, promotions, author appearances, and other attractions. Here’s what’s happening this year! Note that if your favorite store isn’t listed under a particular day, that doesn’t necessarily mean it’s closed—it just means there aren’t any special promotions or events (or that we weren’t able to confirm any by publication time). At Beagle and Wolf Books and Bindery in Park Rapids, all books listed in the store’s holiday catalog will be 20% off, and the store will be open until 8:00 p.m. on Black Friday. There will be hot cider and cookies for shoppers starting at noon; authors Jill and Deane Johnson will hold a signing of their book Little Minnesota in World War II at 3:00 p.m.; and Beagle and Wolf will again be participating in Park Rapids’ Yuletide Sampler, which begins at 5:00 p.m. and has local businesses running specials and handing out treats in the run-up to the 6:00 tree lighting. Birchbark Books and Gifts in Grand Marais will be having a sale yet to be finalized at publication time. Buffalo Books and Coffee in Buffalo is having a 20% off sale on almost everything in the store and will be open extended hours, 6:30 a.m. to 7:00 p.m.
Chapter2Books in Hudson, Wisconsin, will have free cookies, cider, and other refreshments and is offering specials throughout the store, including freebies like pens and tote bags. Cherry Street Books in Alexandria will have a number of discounts both Friday and Saturday, including 20% off Melissa and Doug puzzles and toys. Content Bookstore in Northfield is opening early on Black Friday and will be hosting a Holiday Gift Book Talk at 9:00 a.m., where staff will recommend their picks for gift giving. There will also be doughnuts on hand, and local coffee roasters Groundwire Coffee will have a pop-up shop right at the bookstore. DreamHaven Books and Comics in Minneapolis will be offering buy two, get one free (equal or lesser value) on everything in the store from 10:00 a.m. to noon, after which there will be other specials and sales. Drury Lane Books in Grand Marais will be having its annual holiday sale Friday, Saturday, and Monday, with 15% off storewide and 20% off hardcovers. 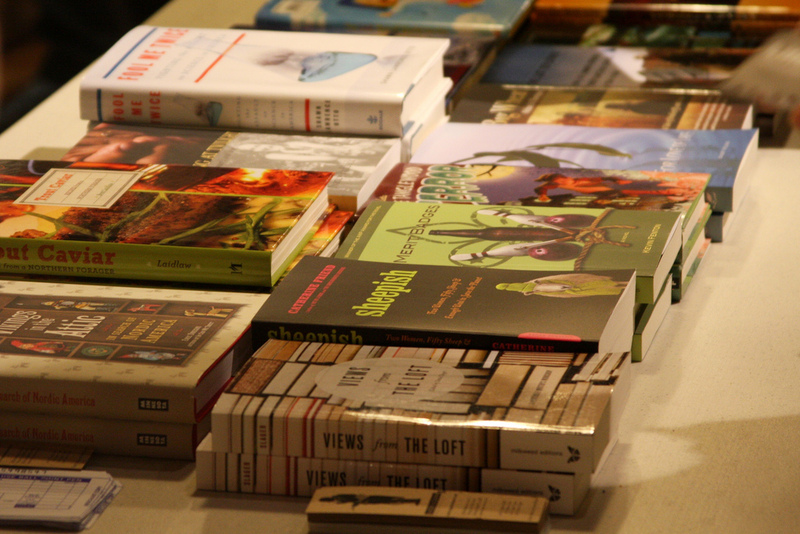 Eat My Words Bookstore in Northeast Minneapolis is celebrating its new location with a two-day “Smorgasbord Sale” running both Friday and Saturday. Get a bigger discount on your whole used-book purchase the more genres or sections you buy from: get 10% off if you buy books from two different genres, 15% off for three genres, 20% off for four genres, or 25% for five or more. Fair Trade Books in Red Wing is hosting the authors of Cooked to Death: Tales of Crime and Cookery from 10:00 a.m. to 2:00 p.m.
Lake Country Booksellers in White Bear Lake is not offering special discounts but will have holiday treats for shoppers both Friday and Saturday. The Little Professor Book Center in Owatonna is having a storewide 20% off sale for everything except magazines on both Friday and Saturday. Magers and Quinn in Uptown Minneapolis will be celebrating Plaid Friday with early-morning doorbuster giveaways from local publishers. Mayday Bookstore on the U of M West Bank will be offering 15% off paperbacks and 20% off new hardcover books all weekend. At 9:00 a.m. Friday, Moon Palace Books opens for the first time in its new location at 3032 Minnehaha Avenue (just down the street from its previous space at 3260 Minnehaha). Scout and Morgan Books in Cambridge will be offering 20% off all in-stock used books and giveaways of books and tote bags on Friday, Saturday, and Sunday. In addition, you can get extra discounts with one coupon available on the store’s Facebook page and another in their holiday catalog. At Sixth Chamber Used Books in St. Paul’s Macalester-Groveland neighborhood, get a $5 gift card for every $50 you spend Friday through Sunday. Uncle Edgar’s Mystery Bookstore and Uncle Hugo’s Science Fiction Bookstore in Minneapolis will be celebrating Uncle Edgar’s 37th anniversary with an extra 10% off almost everything in both stores. Valley Bookseller in Stillwater will be open extended hours, 9:00 a.m. to 8:00 p.m., and is offering a special deal through December 24: buy $100 in gift cards and get a $20 gift card for free. The first 25 customers will get a $5 gift card with purchase, and if you buy specially bundled items you can save 20% on Black Friday and Small Business Saturday. There will also be a signing with Elizabeth Verdick (Small Walt) at 10:00 a.m. The Village Bookstore in Grand Rapids will be holding a drawing for gift cards and offering 20% off kid’s puzzles and toys, Minnesota gifts, and candles from Michelle’s Candles and Colonial Candle. 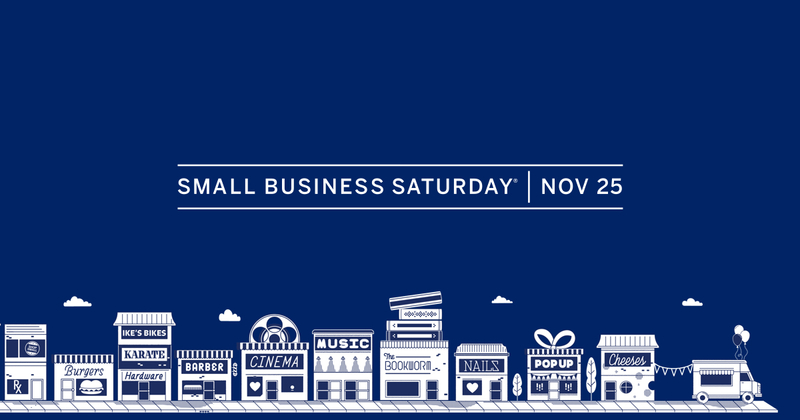 On Small Business Saturday, Addendum Books will be hosting authors as guest booksellers as part of the Indies First program. At the Amazing Alonzo in Duluth, any purchase will get you a $10 off coupon for your next regular-stock book purchase. There will also be free Shop Small tote bags while supplies last—get there early if you want one! Beagle and Wolf Books and Bindery will have Indies First tote bags and refreshments on hand and will be giving away a free book with any purchase while supplies last. In addition, the store will be hosting three authors throughout the day: Elisa Korenne (A Hundred Miles to Nowhere) from 11:00 a.m. to 1:00 p.m., Sarah Seidelmann (Swimming with Elephants) from 11:00 a.m. to 3:00 p.m., and Candace Simar (Dear Homefolks) from 1:00 to 3:00 p.m. The Bookstore at Fitger’s in Duluth will be hosting two author appearances on Saturday: Lise Lunge-Larsen (Seven Ways to Trick a Troll) from noon to 2:00 p.m. and Tony Dierckins (Duluth’s Historic Parks) from 3:00 to 5:00 p.m.
Buffalo Books and Coffee will have in-store specials and prize drawings as well as a book signing with author Christine Husom from 10:00 a.m. to noon. As on Friday, Chapter2Books in Hudson, Wisconsin, will have free cookies, cider, and other refreshments and is offering specials throughout the store, including freebies like pens and tote bags. Common Good Books in St. Paul will be hosting author Nancy Hedin from 1:00 to 3:00 p.m. for a signing of her book Bend. Content Bookstore in Northfield will have coffee and treats in the morning; guest booksellers Benjamin Percy, Kaethe Schwehn, and David Huyck between 11:00 a.m. and 2:00 p.m.; and free tote bags and other giveaways throughout the day. DreamHaven Books and Comics will be having one of its biggest sales in 40 years, with regular used hardcovers and trade paperbacks 50% off, collectible paperbacks 50% off, $3 clearance books selling for only $1.00 each, and many other discounts. Drury Lane Books in Grand Marais continues its annual holiday sale (Friday, Saturday, and Monday) with 15% off storewide and 20% off hardcovers. Eat My Words Bookstore in Northeast continues its “Smorgasbord Sale”: get 10% off your whole used-book purchase if you buy books from two different genres, 15% off for three genres, 20% off for four genres, or 25% for five or more. The store is also hosting a new-issue release party for local literary magazine Whistling Shade at 7:00 p.m. Saturday evening. Fair Trade Books in Red Wing is hosting Elizabeth Verdick, author of Small Walt. The Little Professor Book Center in Owatonna continues its storewide 20% off sale on everything except magazines. Magers and Quinn will be hosting local artist Monica Edwards Larson of Sister Black Press as a guest bookseller. Mayday Bookstore will continue offering 15% off paperbacks and 20% off new hardcovers. At Milkweed Books, which recently celebrated its first birthday, all staff recommendations will be 10% off, plus the bookstore will have free coffee from Peace Coffee and beer from Able Seedhouse and Brewery, guest booksellers from fellow Minneapolis indie publishers Coffee House Press and Graywolf Press, a reading with Alex Lemon from his new memoir Feverland (5:00 p.m.), and more. Click here for details. At Moon Palace Books, get a $20 gift card for every $100 worth of gift cards you buy. As noted above, Moon Palace will be operating in its new location at 3032 Minnehaha Avenue starting on Friday. If you can’t come to the store to buy in person, the gift-card special will be available online until midnight. At Paperbacks and Pieces in Winona, coloring books will be 50% off, and you can get a free advance reader copy of a book with any purchase of $20 or more. There will also be special drawings throughout the day. Red Balloon Bookshop on St. Paul’s Grand Avenue will be hosting a whole list of authors as guest booksellers throughout the day: Drew Brockington, Rick Chrustowski, Megan Maynor, Melanie Heuiser Hill, Alison McGhee, and Kelly Barnhill. Scout and Morgan Books in Cambridge will continue its 20% off sale on all in-stock used books and giveaways of books and totes bags on Friday, Saturday, and Sunday. In addition, you can get extra discounts with one coupon available on the store’s Facebook page and another in their holiday catalog. At Sixth Chamber Used Books in St. Paul, you can get a $5 gift card for every $50 you spend Friday through Sunday. SubText Books in downtown St. Paul will have coffee and doughnuts in the morning, a children’s story time from 11:00 a.m. to noon, and music and more treats in the afternoon. All day long, the store will also be running a raffle for a gift basket full of books, a T-shirt, and a gift card, and a “blind date with a book” table where readers can buy books sight unseen except for a brief blurb. At Uncle Edgar’s and Uncle Hugo’s in Minneapolis, the store-branded T-shirts, sweatshirts, and book bags will be 50% off. Valley Bookseller will continue the following promotions from Friday: extended hours, 9:00 a.m. to 8:00 p.m.; buy $100 in gift cards and get a $20 gift card for free (through December 24); the first 25 customers get a $5 gift card with purchase; and if you buy specially bundled items you can save 20%. There will also be a drawing for a Gabriela American Girl Doll and book (one entry with purchase) as well as chocolate and other small giveaways for kids. As on Friday, Grand Rapids’ Village Bookstore will be holding a drawing for gift cards and offering 20% off kid’s puzzles and toys, Minnesota gifts, and candles from Michelle’s Candles and Colonial Candle. Zenith Bookstore in Duluth will be hosting signings by local authors Linda LeGarde Grover (Onigamiising: Seasons of an Ojibwe Year, 11:00 a.m. to noon); Beatrice Ojakangas (Homemade, noon to 1:00 p.m.); Barton Sutter (Cold Comfort, 1:00 to 2:00 p.m.); Sheila Packa (Night Train Red Dust, 2:00 to 3:00 p.m.); and Lise Lunge-Larson (Seven Ways to Trick a Troll, 3:00 to 4:00 p.m.). Also keep in mind this list does not include Minnesota’s many great comic shops, such as Comic Book College, High-Class Comics, Mead Hall Games and Comics, the Source Comics and Games, and more. And plenty of non-bookstore businesses are having promotions this week, including many of the drop-off locations for the Twin Cities Geek Holiday Toy & Book Drive! Madeleine is Twin Cities Geek's co-head and chief word nerd as well as a freelance editor and writer who tweets intermittently as @mnbookgeek. She is the commissioning editor of Treknology: The Science of Star Trek from Tricorders to Warp Drive. Than you SO much for the work you put in to gathering this fantastic list Madeleine. We really appreciate it.